First appearance "Bats in the Basement"
Count Zoltan Dracula, or simply Count Zoltan, is a vampire native to Transylvania who had a brief stay at Mario Brothers Plumbing. In The Super Mario Bros. Super Show! live-action segment "Bats in the Basement", Count Zoltan moves to Brooklyn, New York from Transylvania as an exchange student, who is being hosted by Mario and Luigi. When Count Zoltan first arrives at Mario Brothers Plumbing in a coffin, he is mistaken for a corpse by Luigi when he opens the coffin, due to Count Zoltan's extremely pale appearance. Eventually, Count Zoltan leaves his coffin and introduces himself to Mario and Luigi and calls his new "home" a dump before going back to sleep in his coffin. Later, over breakfast, Luigi begins trying to tell Mario of how odd Count Zoltan is; at first Mario doesn't notice anything odd, but eventually agrees with Luigi that Count Zoltan is strange. It is only after finding a large amount of evidence, such as a red stained shirt, a bill from the blood bank and a several dental floss and eyewash receipts, that Mario and Luigi make the horrific conclusion that Count Zoltan is a vampire; as Mario and Luigi realize this, they suddenly see the silhouette of a bat fly by their window, with Count Zoltan's singing voice seemingly coming from it. Count Zoltan scares Mario and Luigi. The next day, Mario and Luigi, using a book entitled "How to Get Rid of a Vampire", begin trying to figure out how to get rid of Count Zoltan. 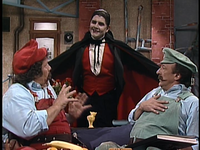 As Mario and Luigi read, Count Zoltan suddenly appears behind them and asks Mario and Luigi if they want to know how to really get rid of a vampire. Asking Count Zoltan how, Mario and Luigi get the response from him that they just need to ask him to leave. The Exterminator, a vampire who later appeared in The Super Mario Bros. Super Show! 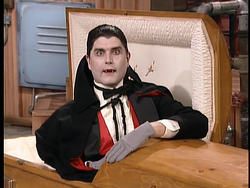 live-action segment Vampire Until Ready, is not only similar to Count Zoltan in appearance and demeanor, but is also played by the same actor Jim Ward. The Count's first name is taken from the cult film Zoltan, Hound of Dracula. This page was last edited on January 28, 2019, at 03:15.